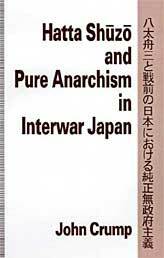 I'm seeking to read this book as I sympathise with the idea of 'pure' anarchism. In a twisted sense it sounds strange, discriminatory and barbaric as surely nothing is pure? However, it seems as if Hatta Shuzo is inviting the audience to view the greater scheme of things when it comes to people and collective actions against tyranny, despotism and the state of being governed. Although I have not a copy myself of the book I have read passages from friends copies, and discussed its content with interested people. It seems as if the anarchism being defined is the sheer force of not wishing to submit to authority in the neverending pursuit of human freedom and its quest to achieve it absolutely - not through market liberal capitalism or an assembly of workers' councils. In a book I read before joining libcom I came across a book called 'Demanding the Impossible' the author Peter Marshall makes similar links to anarchism demanding local communities to be imbued with power at a grass root level - rather than power to be centralised in the ideological vision of anarcho-communism within workers councils and industrial bases as class conflict would inevitably rise again. Overall this seems a good book I desire to read for myself! Yeah, it does seem a pretty interesting idea, I guess I just read it and correlated it with the whole aryan, pure nazi thing. Thanks for the pamphlet!